Hello everyone, CEO Olivia here. I can sploot & do it often, but my fur sister Suzie Q can’t sploot at all. So, what is a sploot? What’s splooting? I’ll explain. At home we call it doing the “frog Dog”, but for this article it’s the sploot. 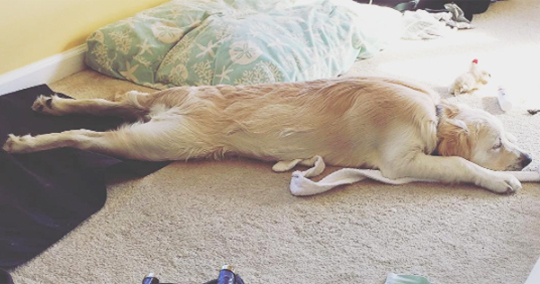 The sploot is a type of stretch that some dogs & cats do. The sploot is defined as a dog or cat laying on their belly while stretching their legs straight out behind them. When huMom see’s me splooting, she always smiles. There are a lot of reasons why a good dog might sploot. Often we just need a good stretch in our hips & legs. Splooting feels good. When I’m feeling hot I like to sploot on the cool kitchen tiles. I can cool my belly that way. Does your good dog or cat like to sploot? I’d like to see some pictures. Now if you’ll excuse me, I need to go sploot on the kitchen floor. I like to sploot too! My humom also likes to call them frog legs too 🙂 I sploot a lot on the grass to cool off after a good game of fetch.